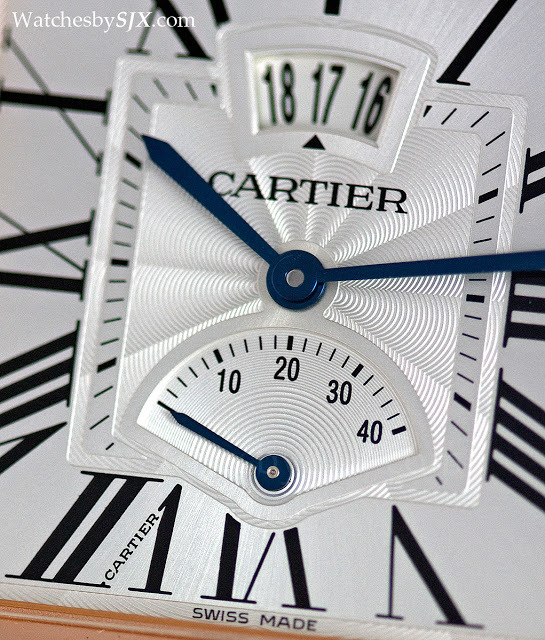 Cartier had a strong year in 2013. 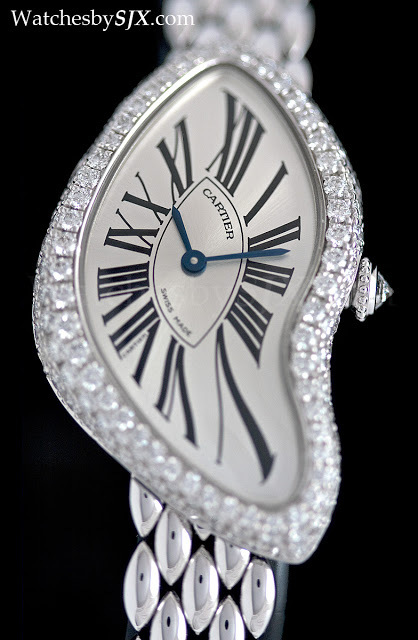 Amongst the SIHH exhibitors, it was amongst the best in terms of breadth, complications and ideas. 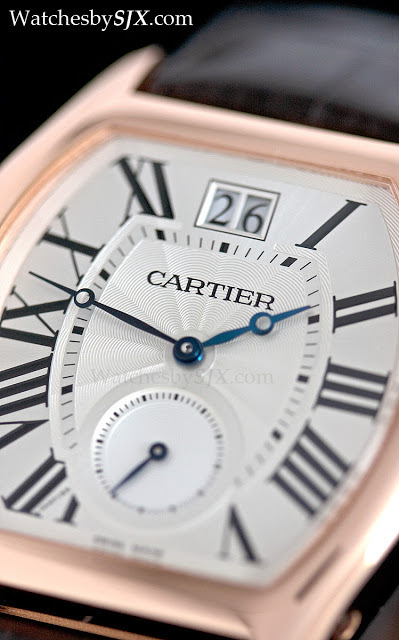 For me the notable watches are the pair of mystery watches in the Fine Watchmaking line, the Crash on bracelet, and the little publicised small complications in Santos-Dumont and Tortue cases. 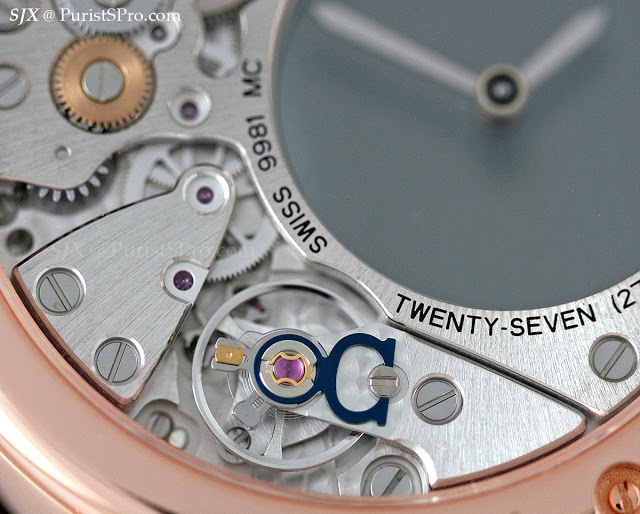 I will cover a few highlights from the 2013 collection here. 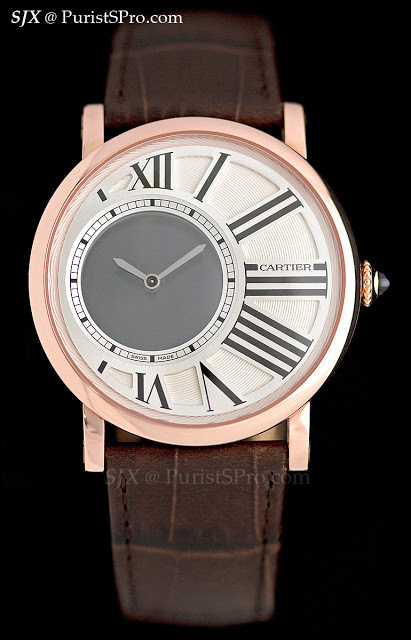 Additional detail on these watches, as well as the rest of the 2013 collection, can be seen on the Cartier forum I moderate. 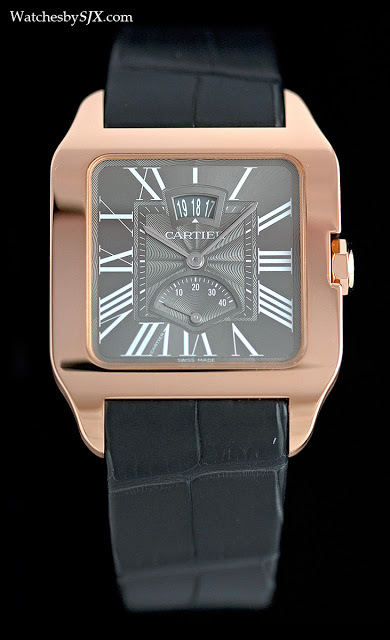 Inspired by the iconic Cartier mystery clocks of the early 20th century are the two Rotonde de Cartier mystery watches. 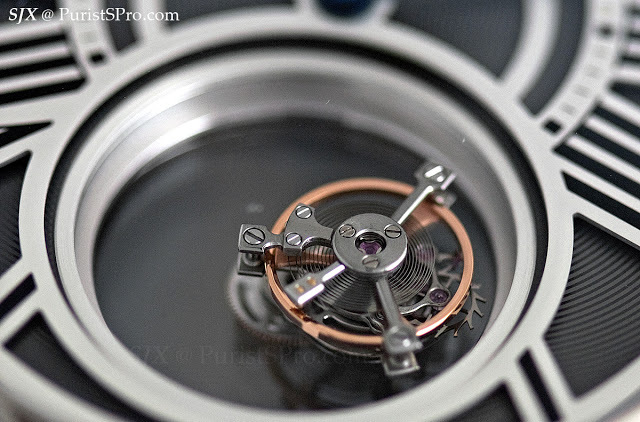 Both work on the same principle of a sapphire disc with a toothed rim that is driven by gears hidden under the dial, just like the original mystery clocks. 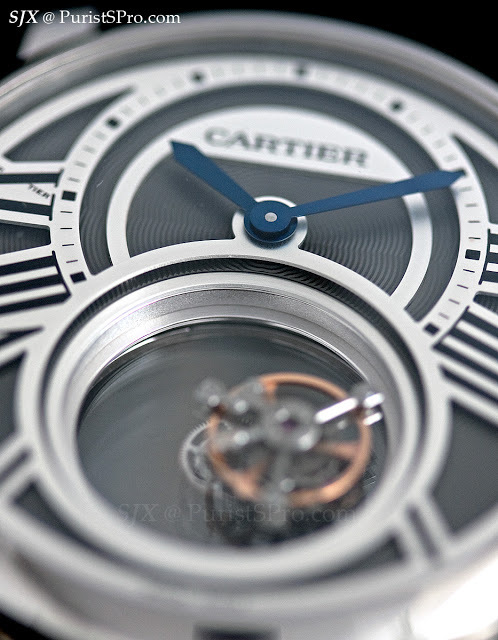 The more complicated of the pair is the Rotonde de Cartier Mysterious Double Tourbillon. 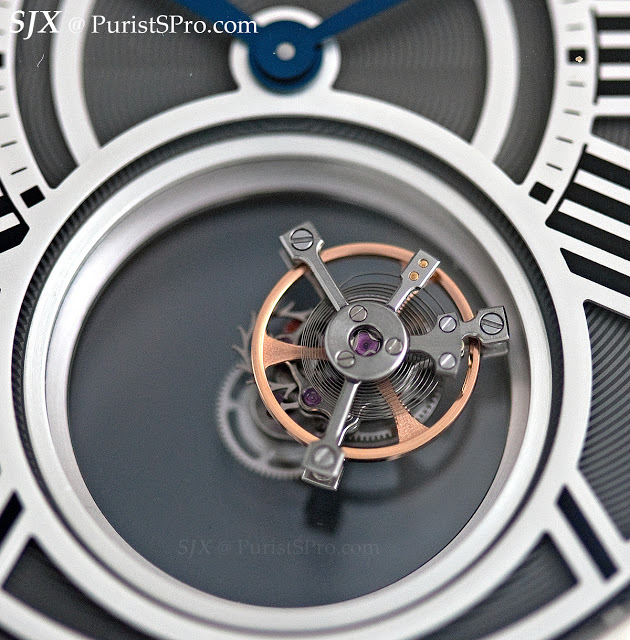 The tourbillon cage makes one revolution a minute, while the sapphire disc on which the cage is mounted makes one revolution every five minute, hence the “double tourbillon” moniker. 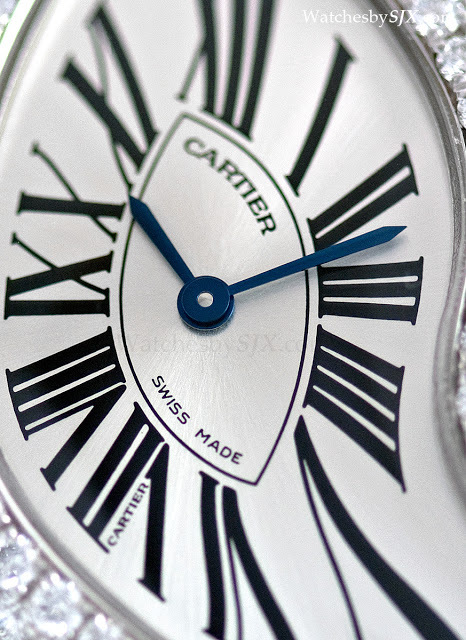 Though large at 45 mm, this is a beautifully executed watch and a charming complication. 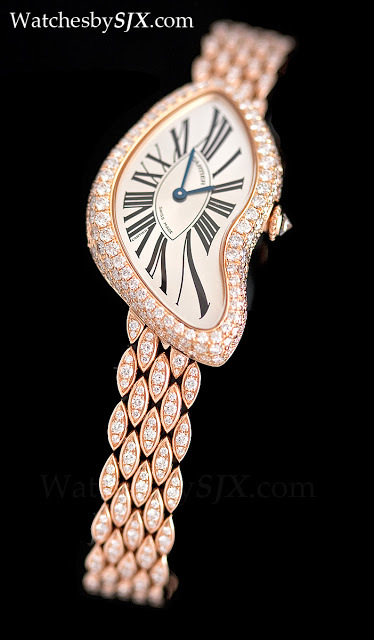 This is also available fully set with baguette diamonds. 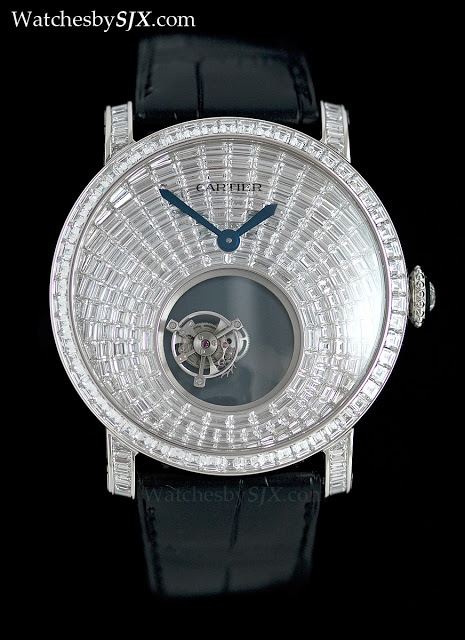 The other mystery watch is the Rotonde de Cartier Mysterious Hours, which displays the hours and minutes mysteriously. 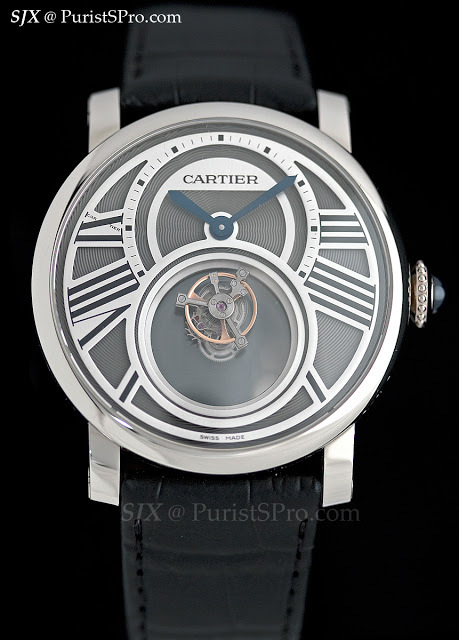 Like the mystery double tourbillon, this is a feat of micro-engineering, with the movement condensed into the C-shaped area around the sapphire discs. 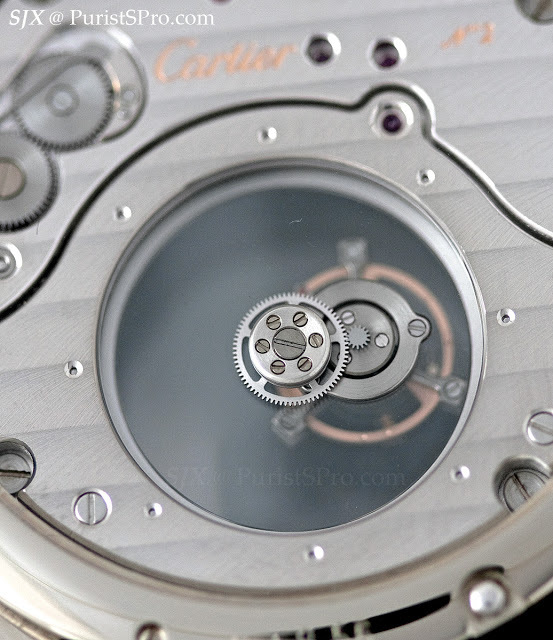 Despite its small area, the movement still manages a respectable 48 hour power reserve. 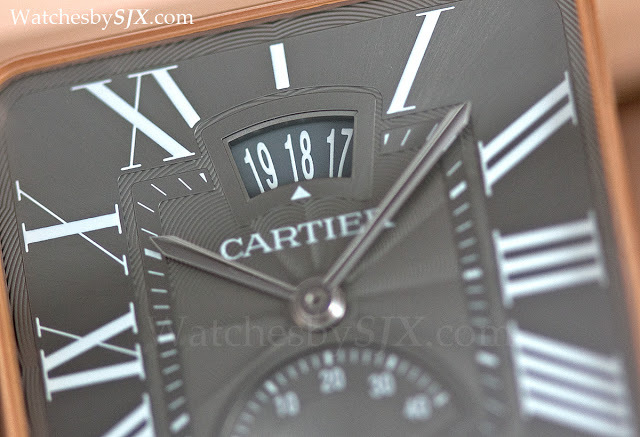 Two more models from the Fine Watchmaking collection were covered here as part of the pre-SIHH releases, the Ballon Bleu de Cartier Tourbillon Double Jumping Time Zones and the Rotonde de Cartier Perpetual Calendar Chronograph. 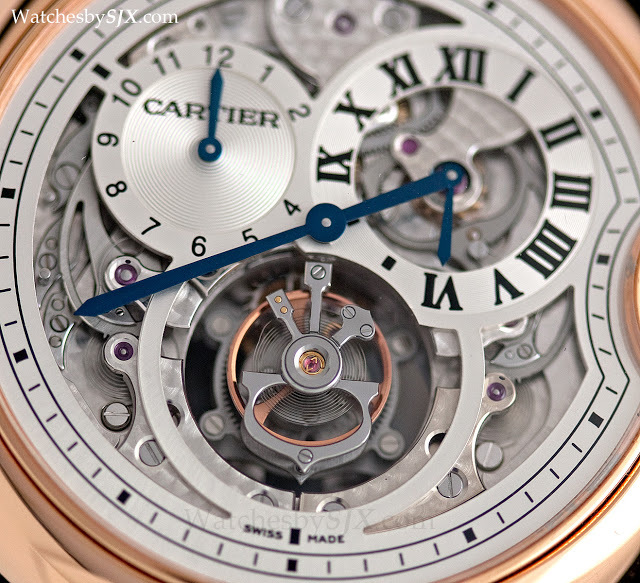 In addition to the Fine Watchmaking line, Cartier also makes mid-range mechanical timepieces. 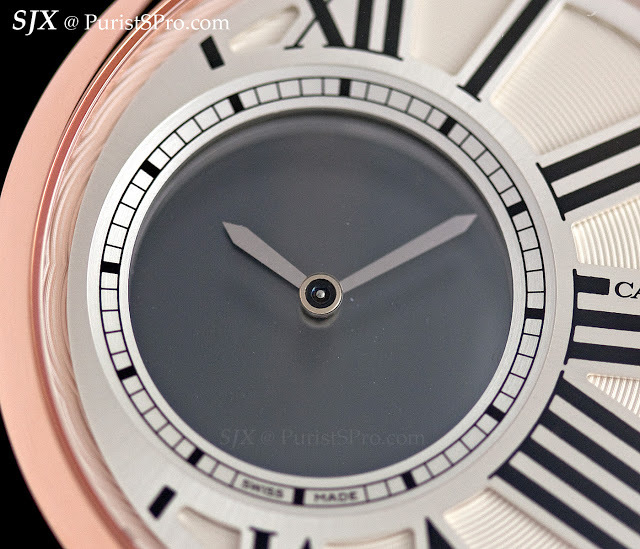 This collection of watches has no formal, but they typically have small complications like power reserve or second time zone. 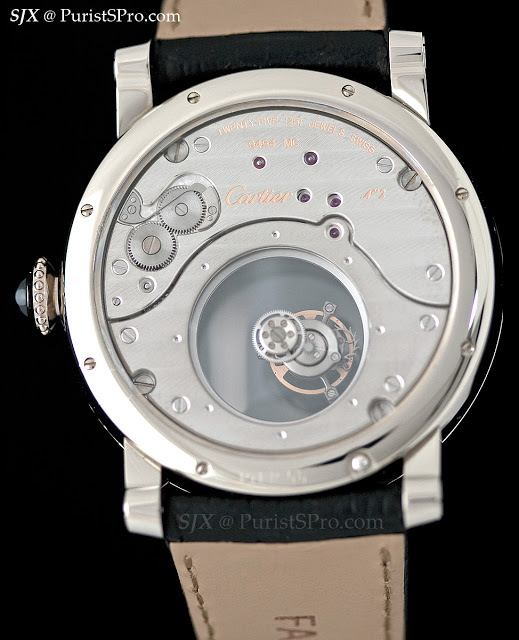 Two models in this segment were added in 2013, the first being the Tortue XL with big date. 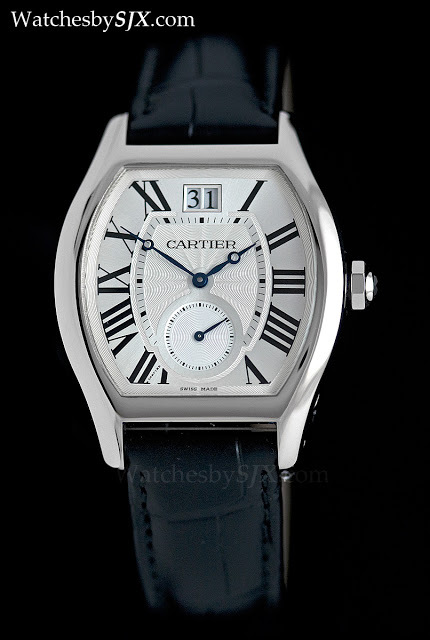 Equipped with a JLC derived calibre, this is not extremely complex, but nevertheless elegant and in the traditional Cartier style and shape. 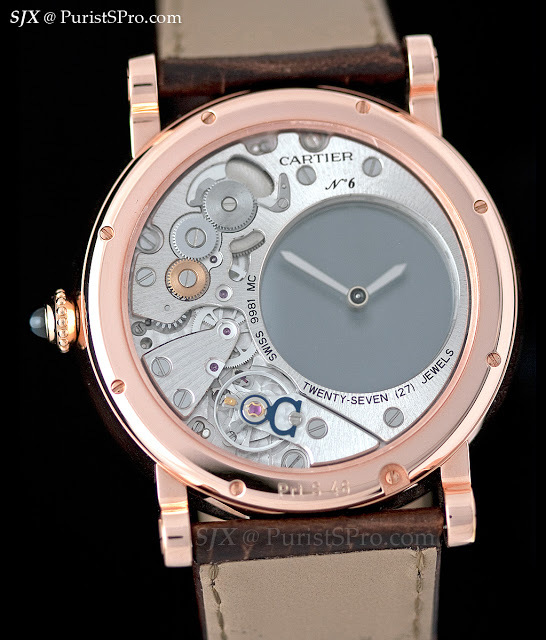 The second model is the Santos-Dumont with date and power reserve, with a Piaget movement inside. 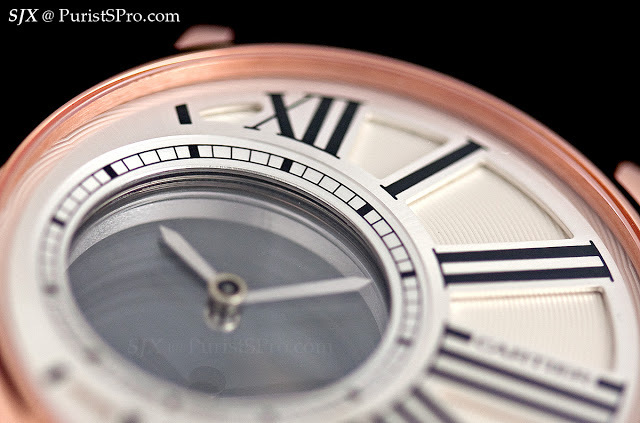 I like the aesthetics of this; the case is noticeably thicker than the existing Santos-Dumont dress watch, giving this a more substantial and masculine feel. 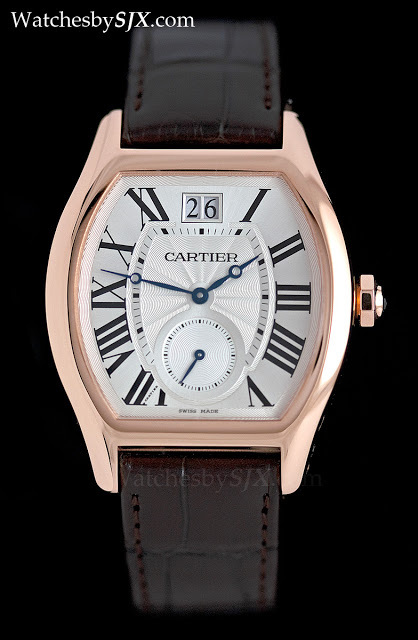 In a similar price segment is the Calibre de Cartier Chronograph with the new in-house 1904CH-MC calibre, which was shown before SIHH. 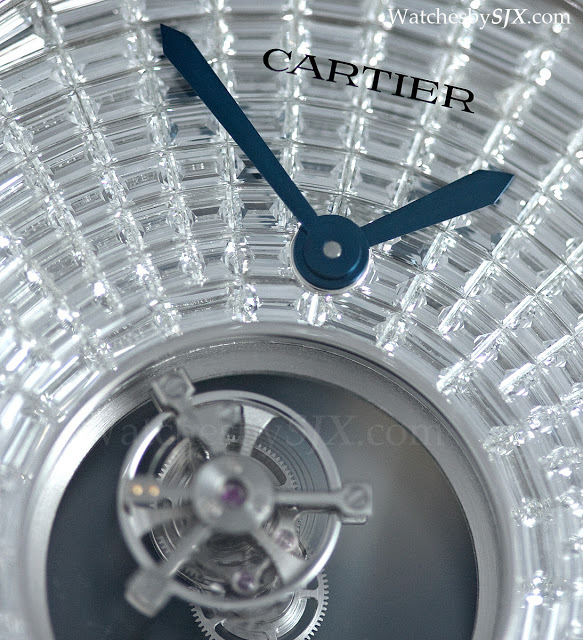 Cartier is of course a grand jeweller, and it unveiled a range of stunning jewelled timepieces at SIHH. 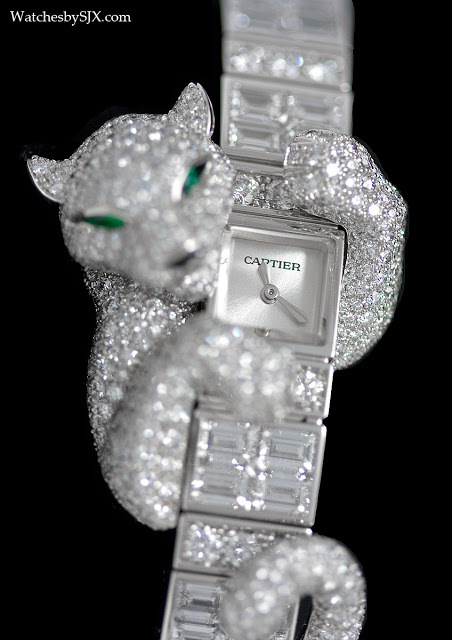 One of favourites is the Baguette Panthère watch, which features a panther club clinging to a tiny (quartz) wristwatch. 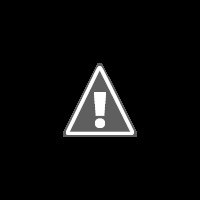 But the highlight for the ladies is undoubtedly the new Crash limited edition on teardrop bracelet. 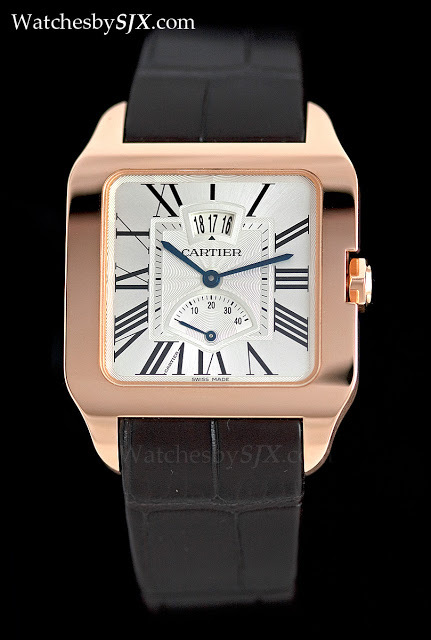 Though not exceptionally attractive in the stock photos, the bracelet is fine and matches the watch perfectly in person.